The research of my group focuses on determinants of behavior, especially of behavioral phenotypes that are relevant across species and that are affected in various psychiatric disorders (e.g., social interaction and behavioral flexibility). By means of interspecies genetic analysis of neurobehavioral traits (of mice and men) we aim to identify genotype-phenotype relationships relevant to the development and treatment of autism spectrum disorders, eating disorders, and schizophrenia. 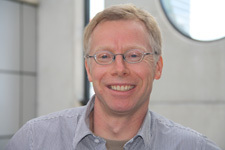 Following his PhD research at Stanford University (USA) on circadian rhythms and sleep/wake regulation and a post-doc of molecular genetics of feeding behavior in Utrecht, Martien Kas is currently appointed as an associate professor at the Department of Translational Neuroscience of the Brain Center Rudolf Magnus, University Medical Center Utrecht. In addition to being a member of the Executive Committee of the European Congress of Neuropsychopharmacology (ECNP), he is the President of the Dutch Behavioural Genetics Contact group, board member of the Dutch Neurofederation, a selected member of Faculty of 1000 Medicine, and member of SYSGENET; an European network for systems genetics.